As a business owner, you want to ensure that you are always involved in promotional and marketing efforts. Two main types of promotional efforts exist: passive and active. Active efforts are actions such as cold calling, door-to-door sales, digital marketing, flyer posting, ad submission and the like. Passive efforts are processes that you go through one time, and they continue to help your business for years. You can choose both methods of promotion and increase your chances of enticing new customers every day. Signs can be an amazing form of passive promotion for your business. Your business can hire someone to create a sign that will draw customers into your establishment time and time again. The term lust does not refer to sensual lust unless you run that type of establishment. Lust refers to anything that the consumer’s flesh desires. The term can refer to physical thirst, hunger, love for electronic devices or something else. For example, parched summertime customers are highly likely to stop at your highway smoothie shack and purchase a personal version of your delicious cherry smoothie if you have a picture of it on your store sign. Young people will stop by your cell phone shop if your sign shows them that they may be able to walk out with a Galaxy S7. Visitors may pick your diner if your sign makes their mouth water for your Super-Slam breakfast. A sign that has pictures on it creates a subliminal desire. The subliminal desire turns into an immediate want or a perceived need in the consumer’s mind. The perceived need creates unexpected sales for your business. The right sign can draw customers to your business by announcing some type of a deal or statement about a possible deal. For example, “Grand Opening” translates to “free” or “cheap” in the minds of some consumers. Some consumers will visit the store just because they desire to see something different. Of course, you can use the term free in your sign, as well. That always translates to “free.” If you “free” it, they will come. You will get visits from people all over the state and from other states if your store is in an excellent highway-grounded location. You can have a sign made that takes the slow and subtle approach. The catch-phrase strategy may take a while to sink into a prospective customer’s mind, but it will work. Drivers see signs that stand out. They notice signs that are outlandish in style or have words that stick. Your sign should contain some terminology that enters their brains when they first see the sign and stays there until they come for some of your products and services. “Kickin’ chicken,” “juicy burgers,” “killer pest control,” “spot-on repairs” and “blazing jalepenos” are just a few examples of terminology you can use to nab some customers. A professional sign company can assist you with the process of creating the perfect sign. 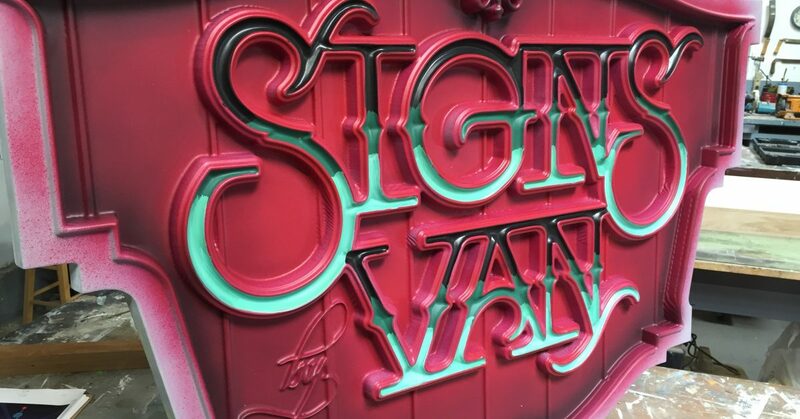 Signs by Van has been helping business owners to create effective signage for more than 33 years. You can schedule an appointment with an expert and create the perfect sign for your business. The phone number to the business is 831-663-2663. The process starts with you discussing the vision that you have for your business. The process ends when the specialist creates a sign that delivers prospective customers to your doorstep.